The Institute continued as a successful seat of learning in its own right through most of the 20th Century before becoming an annex for Staffordshire University and most recently Stoke-on-Trent College. In 1993 the building was inspected in the light of new fire escape regulations and its use was consequently restricted to the ground floor. The College ceased using of the Institute later that year leaving only the Library in residence. 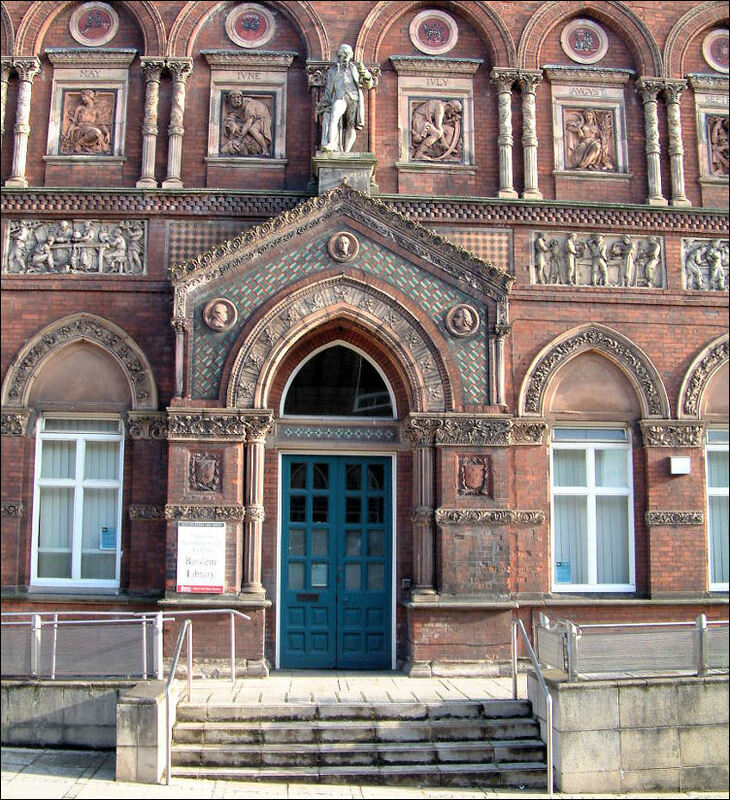 "This is not part of a sumptuous palace in some sunny Venetian square but the facade of the Wedgwood Institute, Burslem. The central character of this architectural spectacular is Josiah Wedgwood, who, from his vantage point over the tiled entrance, surveys the rush of traffic and pedestrians. His background consists of a colourful wall, richly decorated with carvings depicting the various stages of pottery manufacture; figures that represent the months; inlaid signs of the zodiac; arches, pillars, foliage, and many interesting examples of mosaic and brick work. 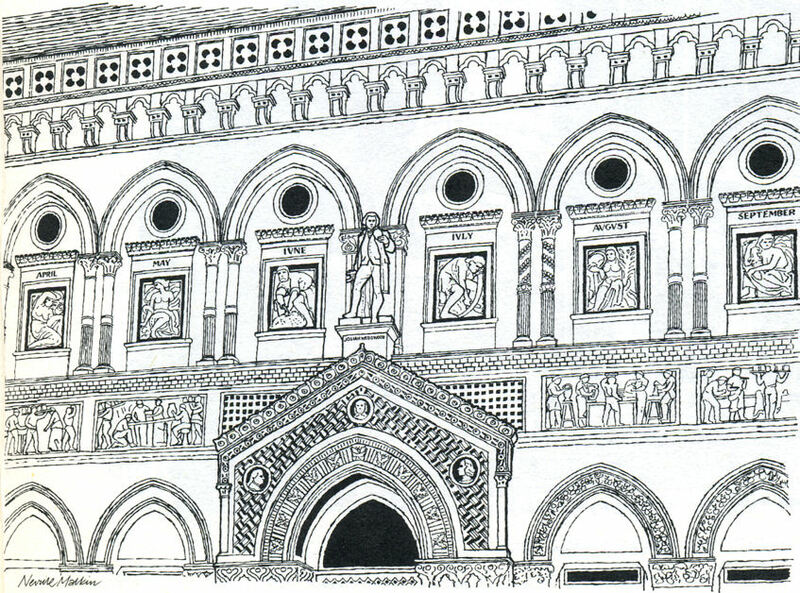 The design and plans were by Mr. G. B. Nichols who was obviously influenced by the work of 15th century Italian architects; the terracotta details were by Rowland Morris and William Wright, national scholars from the Potteries School of Art. A decision to acquire a site for an institute as a memorial to Josiah Wedgwood was made in 1859, and in 1863 land was bought in Queen Street for £1,500. Mr. W. E. Gladstone, M.P., Chancellor of the Exchequer, laid the foundation stone in October of that year. Beneath the stone, a china casket was placed, containing a record on vellum of the building to be erected. In 1869, the building was completed and officially opened by Earl de Grey. 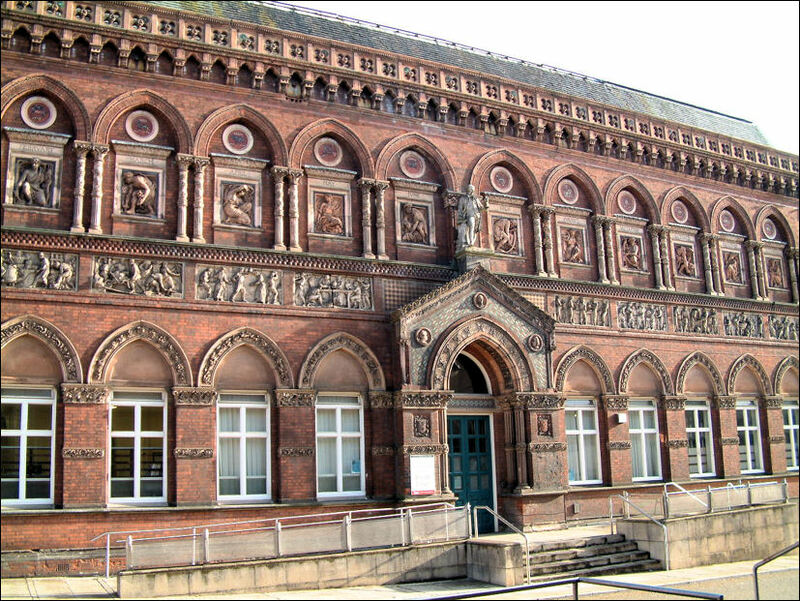 Burslem was the second town in the country to take advantage of the Free Libraries Act which insured an annual income of £200 for the Institute. The first school of art in the Institute was founded in October, 1869, and the appointed headmaster, Mr. G. Theaker of the South Kensington Art School, held the position until his death in 1902. In 1894, the new Technological Schools were incorporated and opened by Princess Louise. By 1898 there were 400 students attending the various technical and art classes. One student was Oliver Lodge, the great scientist."